Do you want to pull movie information straight from IMDb? This guide will show you how to improve content listings by integrating IMDb into Kodi. Kodi is one of the most popular media center packages available. It can be easily installed or used across a wide range of platforms including every Amazon Fire TV device, Apple TV, and Roku. Better still, there’s very little difference between the different versions. If an addon works on desktop, it’ll likely work on mobile devices too. Users can install plugins known as addons to increase the size of their media library. However, the information available on each title is usually very limited. By scraping movie data from the Internet Movie Database (IMDb), you can find out far more about each title before watching. This article will explain how to use the IMDb to improve your Kodi experience. 1.0.1 READER DEAL: Save 60% on an IPVanish plans here. 2 What is IMDb and how can it improve Kodi? Some people connect to virtual private networks (VPNs) to conceal unauthorized streaming from their internet service provider (ISP). Despite this, there are actually many ways a VPN can benefit most people, even those that only stream from official sources. VPNs work by encrypting your network traffic, keeping it hidden from any third party observers. This protects you both from Man-in-the-Middle attacks and your ISP, who may seek to sell your browsing habits. This encryption also stops your ISP from using your activities as justification for throttling your connection. Every VPN provider is different, however. Some slow your connection down to a crawl while others keep records of everything you do. For these reasons, choosing the right provider is crucial. We recommend IPVanish. It offers consistent connections to servers in more than 50 countries and has minimal impact on your network speeds. Further, it’s one of the most portable VPNs and can be easily installed on Android and iOS. It’s also the only major VPN included in the Amazon Firestick app store. READER DEAL: Save 60% on an IPVanish plans here. What is IMDb and how can it improve Kodi? IMDb is one of the internet’s largest collection of information related to movies, TV shows, and video games. It currently holds details on almost 5,000,000 titles and over 8,000,000 actors, actresses, and crew members. So how can this data be used to improve your Kodi experience? 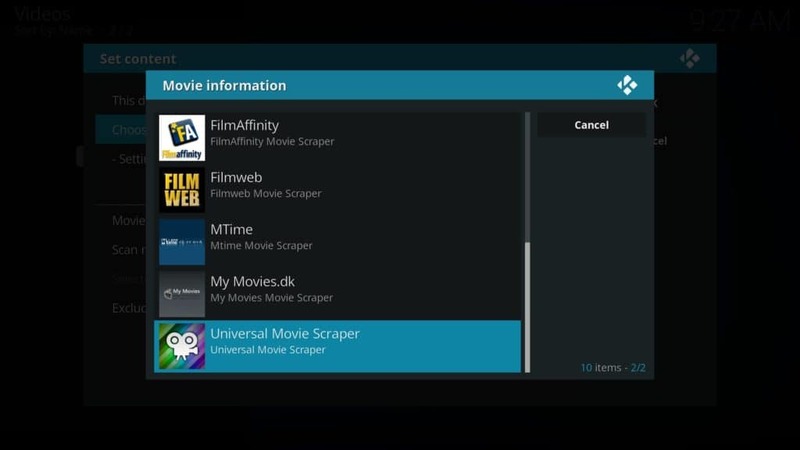 When you select a movie or TV show in Kodi, it uses a Python scraper to find relevant information. Usually, you’ll see only the most basic details: the movie’s name and possibly the year it was released. However, by using a different scraper, you can find out much more detailed information for any given production. Let’s begin by changing the default scraper to one that pulls information from IMDb. It’s important to note that this will only affect locally stored content. Most addons that allow you to change the scraper used provide unlicensed streams, so be wary of these. Remember that official sources will almost always provide the most accurate information for their content. You’ll be given the option to rename the source or change its location but for now just click the OK button at the bottom. On the following page, click the Choose information provider option, then click the Get more… button on the right. There are a lot of scrapers to choose from but the one to install is called Universal Movie Scraper. This searches IMDb by default and also looks at other sites if the title you choose isn’t listed on IMDb. You can choose to install the IMDb + RT scraper instead if you’d like to see Rotten Tomatoes ratings, but this is entirely optional. Once you’ve installed the correct scraper, simply click the OK button on the right to be returned to your list of videos. Once the library finishes updating, you can test if the scraper is working by clicking any title and checking the information against its IMDb listing. 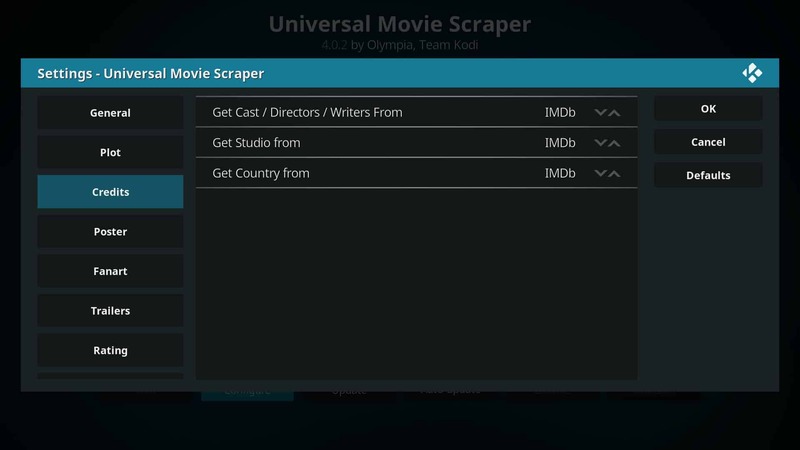 There are a couple of minor tweaks that have to be made to the Universal Movie Scraper before we’re finished. 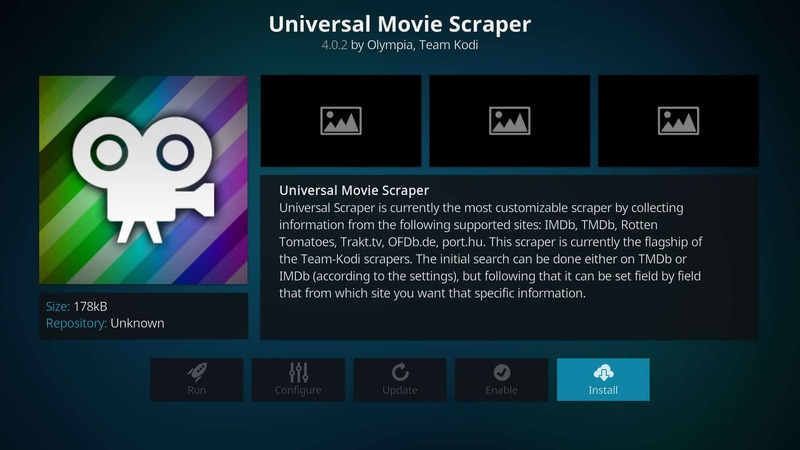 Begin by clicking the Add-ons tab on Kodi’s main page. Next, click Download. On the following page, choose the Information providers option. Finally, click Movie information, Universal Movie Scraper in the list that appears, then Configure. Select the Credits tab, then click the arrows beside Get Studio from until it’s set to IMDb. Next, move down to the Fanart tab and click Enable fanart from themoviedb.org. The top option should already be disabled but if it isn’t, click that too. This will ensure you see only official images from the movie instead of fanart that could potentially spoil the ending. If you live outside of the US, you’ll have to change a settings to make your country’s certification ratings appear. Under the Rating tab, click Preferred Certification Country and choose your location from the list that appears. Once you’re done, click the OK button. Kodi offers a lot of scope for customization but many people focus solely on the different addons that can be installed. However, by spending just a little extra time, you can use Kodi to backup your watch history online, automatically find subtitles for whatever you’re watching, and much more. New to Kodi? We have step-by-step guides to installing your first VPN, watching movies on Kodi, and fixing Kodi’s most common problems including Kodi buffering. We even have articles covering the best addons for sports (including the SuperBowl), live TV streams, and anime in case you’re looking for something specific.